His eatery in remote South Africa has won the World’s Restaurant of the Year Award, but Chef Kobus van der Merwe insists fame will change nothing. “When I saw the other nominees in that list I actually had a giggle, because I thought we were so out of our league,” smiled Van der Merwe, 38, who did not begin to cook seriously until he was 30. Unlike many competitors at last week’s inaugural World Restaurant Awards, a seven-course tasting menu at Wolfgat costs $60 (52 euros) a fraction of what one would pay at a top Paris table. Van der Merwe also forages every day for ingredients on the wild Atlantic shore near his restaurant at Paternoster, and makes his own bread and butter. “I checked my emails and I was like, OK there’s actually an official communication letting us know we have been nominated. So, we had like no clue, absolutely no clue,” said Van der Merwe. 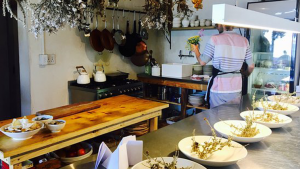 The restaurant’s humble setting in the Western Cape, and Van der Merwe’s belief in sustainable, back-to-basics cooking, won the hearts of judges in the French capital, who named it Restaurant of the Year. “I was in that tiny little kitchen doing all the cooking and we were all serving so we sort of figured it out together,” he said wearing a pristine white shirt and black apron alongside a long beard and curly hair. But the award “is not going to change anything about the scale that Wolfgat operates on,” he said. “The scale that we do (is) sustainable and that’s what works for us,” he said. Van der Merwe vowed not to increase prices despite his new-found fame. Diners on Wolfgat’s thatch-covered terrace are offered small dishes including Saldanha bay mussels served with cauliflower and dune celery alongside bream presented with sorghum, snoek roe and wild sage. But for all of the rugged allure of his remote sea-view eatery, Van der Merwe does face challenges not experienced by leading chefs in major cities elsewhere. “Sometimes, it’s like cooking in a disaster area, we have load-shedding (power-cuts) and no water because the local reservoir has run out. But those are challenges we have to work around,” he said. The post Remote W Cape restaurant savours top award appeared first on SABC News – Breaking news, special reports, world, business, sport coverage of all South African current events. Africa's news leader..